Description: More info comes soon! After Alligator Gumbo´s accordionist Thor Ahlgren traveled around south Louisiana the band recorded the album "Simmerin'". Thor traveled to explore the areas where the basis for the group’s material, tunes and passion is very much alive. The trip began in New Orleans and continued in to the swamplands of south west of Louisiana. There he jammed with legends of cajun and zydeco music (link & link). Thor had brought one of his bagpipes with him on the trip and surprised everyone by tearing off some cajun songs on it. In Alligator Gumbo album Simmerin' the french bagpipes is introduced on a few songs.On the last day before traveling home Thor wrote the cajun song "Le long voyage" (The long journey) and when he was back in Sweden he wrote the song "Cold Cajun". In march 2018 Thor & Josefin produced a tour for the band Cajun Country Revival (website) & Alligator Gumbo in Sweden. The tour started in Göteborg (Konstepidemin), Högskolan för Scen & Musik, Stockholm (AFF), Örebro and then to the village of Hajom, where Josefin grew up and Alligator Gumbo made their music video. 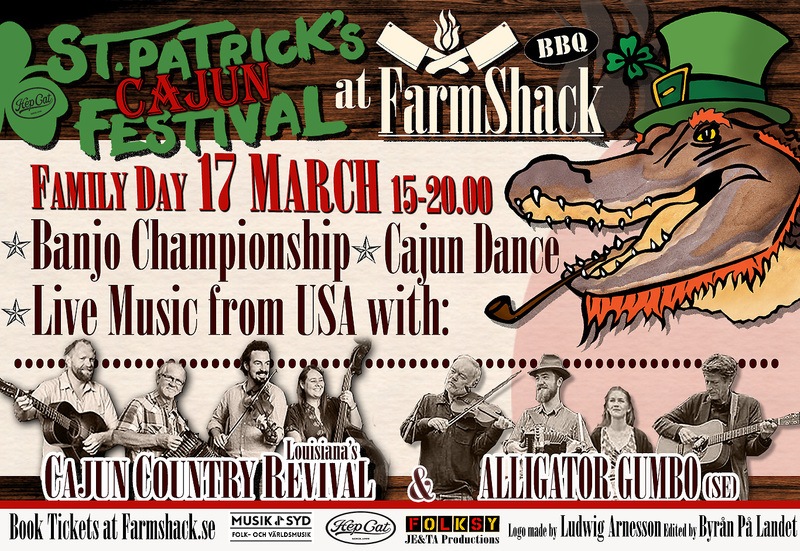 It ended up in Farmshack, Lund on S:T Patricks day where we produced one of a kind "Cajun S:T Patrick" in Sweden with banjo competition. All shows where sold out during the tour.